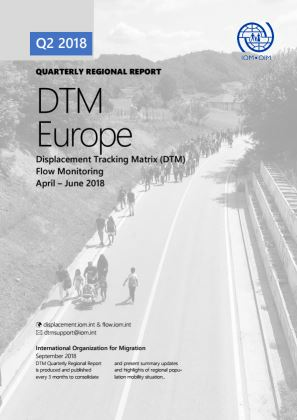 Available DTM data, from national authorities and IOM offices in Europe, shows that by the end of June 2018, a total of 58,357 migrants and refugees arrived in Europe using different land and sea routes. Two thirds of arrivals were registered in the second quarter of the year, a total of 39,402, double the 18,956 registered in the first quarter of the year. By the end of June 2018, IOM Ukraine released the 10th National Monitoring System Report. In the last round, information is collected through interviews with more than 7,600 IDPs and 605 key informants from relevant NGOs and institutions for social protection.